Ms. Tran-Layton is a managing partner of JLJ Law Group, PLLC. She works with clients across the country who want knowledgeable guidance, a trusted attorney, and peace of mind on a daily basis. She immigrated from Vietnam when she was a year old and has lived in Utah since that time. She graduated from the University of Utah, S.J. Quinney College of Law. After law school, she practiced intellectual property litigation at a reputable law firm in Salt Lake City, Utah. Currently, she is practicing immigration law. In her immigration practice, she has assisted a broad range of clients, from individuals to families who are seeking to achieve the American Dream, to businesses who are looking for qualified workers to fill those hard-to-fill positions. She also manages an immigration law blog that covers a variety of immigration law topics, such as employment-based immigration. 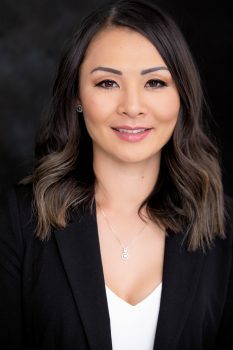 Ms. Tran-Layton understands the importance of having an attorney who will communicate and respond to a client’s legal questions and concerns in a timely manner, especially since legal issues can cause a great deal of stress. As well, she aims to handle each of her client’s cases in a timely and efficient manner, while maintaining a high level of integrity and compassion. Many of her clients can attest to her ability to provide honest answers, to respond quickly to their inquires, and to handle their cases in a timely manner. Ms. Tran-Layton has had high levels of success in assisting clients achieve their goals. While Ms. Tran-Layton was in law school, she received her Pro Bono Certificate of Service, was a member of the Global Justice Think Tank, and completed a law study abroad program in China at Peking University. She was also one of four students chosen to compete in a regional negotiation competition.